As historical writers, we often use foreign languages or local dialects in our stories. It lends it’s own charm to the story. In my manuscript, Crystal Delusions, my heroine, Chandler Thornton, has a deaf grandmother. Sign language is an integral part of the story. I've always thought of American Sign Language (ASL) as a French Connection with a dash of Martha's Vineyard. Sign language is now an accepted language with its own syntax and lexicon. And, as such, can be earned as a language credit in many colleges and universities. According to USA Today, sign language is the fourth most studied foreign language in the United States. 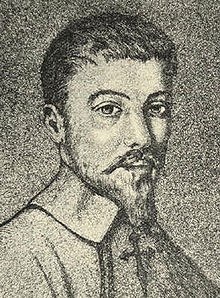 In 1620, Juan Pablo de Bonet wrote a book that demonstrated the first known manual alphabet system. Each hand shape represented different speech sound. His book is Reducción de las letras y arte para enseñar a hablar a los mudos. The title is translated "Summary of the Letters and the Art of Teaching Speech to the Mute." 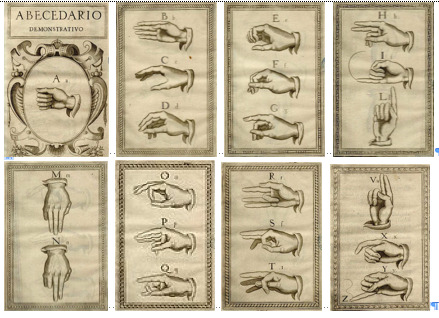 In addition to French and American Sign Language, his system of signs and manual alphabet also influenced Spanish Sign Language. Below are engravings from Bonet's book by Diego de Astor. 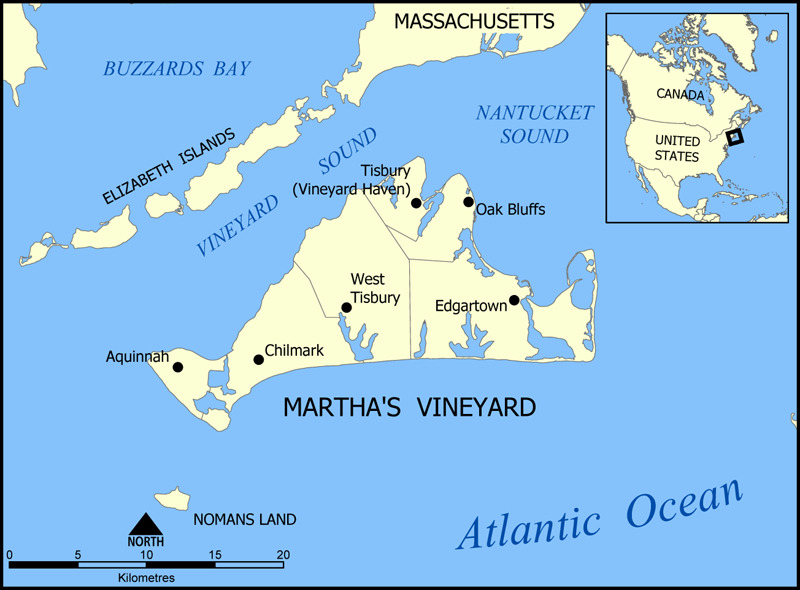 Martha’s Vineyard Sign Language (MVSL) is an early sign language system used on the island of Martha’s Vineyard off the coast of Massachusetts. Starting in the 17th Century, hereditary deafness was very common on the island. 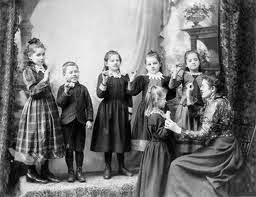 It is recorded that from the late 18th to the early 20th century, virtually everyone on Martha's Vineyard possessed some degree of fluency in the local sign language. It's recorded that Sign Language was taught to children from the cradle and that hearing and deaf used it in everyday life. 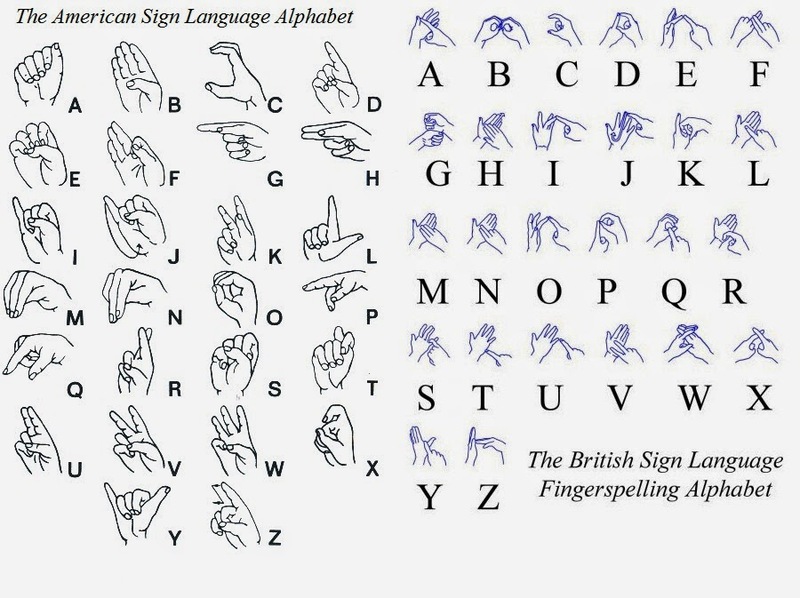 MVSL, also influenced by the Old Kent (England) Sign Language and French Sign Language, had an impact on future schools for the deaf on the mainland. While we have no sign connection with Al-Sayyid Bedouin Sign Language, used by the Al-Sayyid Bedouin tribe in the Negev desert of southern Israel, or the Adamorobe Sign Language used in Adamorobe, an Akan village in eastern Ghana, it's interesting to note that both communities have an unusually high incidence of hereditary deafness. Deaf people are fully incorporated in the both communities, as they were on Martha's Vineyard, and the majority of the hearing people signed. There are other communities around the world that share this unique history. It’s believed that our American Sign Language came via the development of a standard sign language by the Abbe Charles-Michel de l'Epee, a Paris cleric, in the mid-18th century from Old French Sign Language. We know that in 1771 he opened the first free educational institution for deaf people in France. 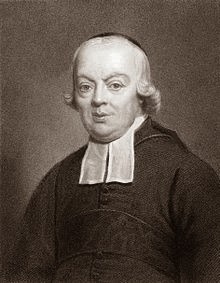 Through his modification of Old French Sign Language, he developed a system of communicating exact words to mimic the spoken language instead of a system of ideas. His new system was called Old Signed French. 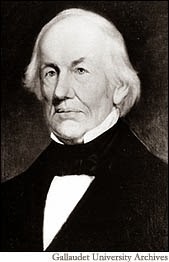 He is considered the Father of the Deaf in recognition of the twenty-one schools he established. 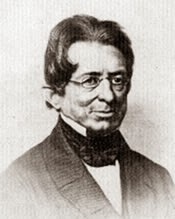 American minister Thomas Hopkins Gallaudet became interested in helping a neighbor’s deaf daughter learn to communicate. In 1816, on a trip to Europe, he met Laurent Cleric, who taught him about deaf education methods and sign language. Cleric, a deaf man and recent graduate of l’Epee’s school, returned to American with Gallaudet. 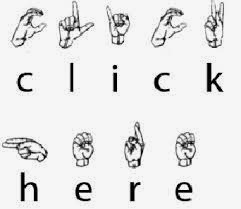 They developed a sign language system based on English’s system of grammar with a sign to represent words and concepts. In 1817, Gallaudet opened America’s first school for the deaf in Hartford, Connecticut called American School for the Deaf. Gallaudet hired Louis Laurent Marie Cleric as the first sign language teacher in America, and later called The Apostle of the Deaf in America. As it is today in the American culture, hearing and deaf kids use formal and informal language. They learn and use the classroom and formal social English language. But they also create new words, tack on new meaning to familiar words; basically creating a new generational language. Shortly after the school's opening, most of the deaf children from Martha's Vineyard were sent to Hartford to be educated. Their village signs were absorbed and contributed to the pool of signs at the school. Gallaudet and Clerc also saw their students using natural language that was free from all grammar rules and syntax; truncated to key phrases. 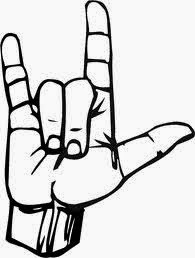 It became known as American Sign Language (ASL). It was Gallaudet’s son Edward Miner Gallaudet who, with the desire to continue his father’s legacy in deaf education, petitioned Congress to establish a deaf college. In 1864, the college division of the Columbia Institution for the Deaf and Dumb and Blind in Washington, DC, was opened. In 1893, the college was renamed Gallaudet College in honor of Thomas Hopkins Gallaudet. In 1986, it became Gallaudet University. It is still known as the first and only deaf university in the world. In the U.S., we have one of the most complete and expressive sign language systems of any country in the world. No, sign language and fingerspelling are not universal. The Brit do it different. Signs vary from coast to coast within the United States because of culture and lifestyle. We used the sign for boots more than we did for galoshes, waders, or high heels. Think about all the different kinds of shoes - sandals, flip flops, sneakers, gym shoes, dress shoes. If you decide to add a deaf character to your story and you want to describe a particular sign important to your plot, check out your location's local signs. What about putting Indian sign language in your historical western? In the picture below, the French and German equivalents are shown for each illustration. 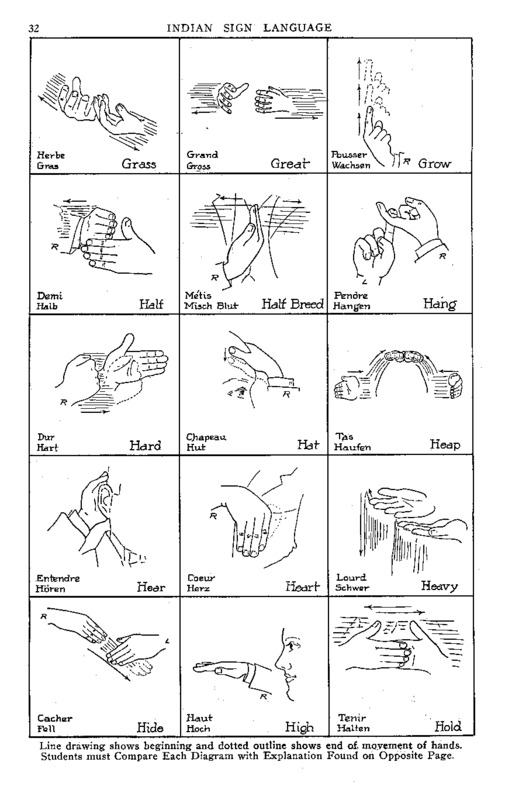 The image is from the Indian Sign Language by William Tompkins. Now, this one is becoming universal — I Love You! Put a little sign language in your life. Lin worked for 18 years as a certified interpreter for the deaf for the Texas Rehabilitation Commission. She still teaches sign language and signs at church. 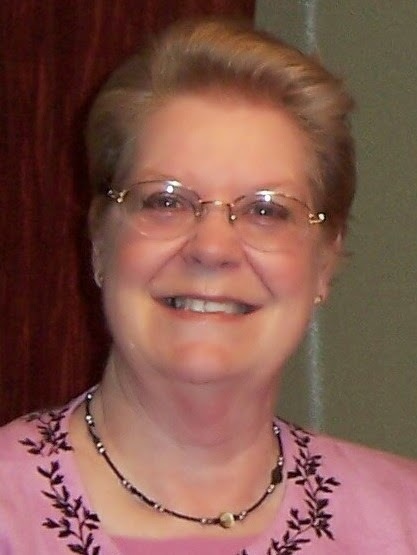 She writes historical fiction for adults and children plus romantic suspense. She and her husband, Jerry, live on a hay and cattle ranch in Chimney Rock, Colorado. In Lin’s Crystal Delusions, what is black and white and read all over? Threatening letters. The kind Chandler Thornton is receiving. It all started innocently enough. Digging up little known legal facts, forgotten laws, answering offbeat questions, and exposing fraudulent activities are all in a day's work. She’s more or less the push that comes to shove. Now, someone is shoving back and he's playing for keeps. When did it start making someone uncomfortable? That's what Chandler must find out and fast because the warning phone calls are frequent and the letters now contain pictures; pictures from every facet of her daily life. Someone is very uncomfortable. Murderously so. Linda, I enjoyed your post. Such great information. My daughter took sign language as a language in college. She loved it and the class used to practice by getting together with the deaf community at a pizza parlor. Thanks for this. Thank you, Nancy. Sign language is such a part of my life, I forget that folks find it new and exciting. I hope your daughter continue learning and interacting with the deaf community. You are welcome, Kay. Thank you taking a moment to let me know. Linda, thanks so much for this very informative post. It is especially timely for me since I am planning to have a deaf child as a secondary character in one of m upcoming stories that will be set in 1896. I'm making note of this post to come back to as part of my research! Hi Winnie, you're welcome. What fun. You're going to enjoy developing your character. I have an article from 1896 that I'll send you. There may be a few nuggets in it you can use. Hi Lin! You know, I have wondered quite a few times if sign was universal or if, like language, it changed from country to country! I've known the sign for "I love you "my whole life but it was my niece & 2 nephews in Nashville who taught me few extra words I know today - while they were less than 18 mos old! My sis-in-law taught them: thank you, you're welcome, milk, and a few others! Let me tell you how handy that was before they could talk!! Great post! Hi Kristen, that's wonderful. Your niece and nephews are so fortunate. Those early years without verbal language must be so frustrating. Having a way to express wants and needs reduces so much stress. When I had a tube down my throat and hands on bandage boards, it was comforting to be able to fingerspell when I couldn't talk, write or sign. One of the best things about using sign language in our all-hearing family was I could discipline our daughter quietly and at a distance. She could let me know she wanted to decline an offer of a sleep over from a friend without the friend knowing - I was the bad guy and said no to the invitation - saved her having to explain to her friend that she just wanted to go home. While traveling in the interior of Mexico, we were told about a school for the deaf run by Canadian nuns in a village that didn't get a lot of English-speaking visitors. My Spanish is okay - I won't starve, but to carry on educational conversations - doubtful. We made the detour and had a wonderful experience. I didn't have to worry about Mexican signs vs. American signs. They had traveled to Austin, where we lived, to the Texas School for the Deaf, and used "The Red Book" as the foundation for their signs. They spoke no English, my Spanish was marginal, but we had great conversations in Sign Language. They showed me a few differences - the sign for rooster to us meant early to them - makes sense since the rooster wakes us up early. Conceptional language is so much fun.